Open the K line chart of international crude oil, and you will find that for only two years, the price of international crude oil has soared to less than US$80 per barrel from June 2010, which has increased by more than 25%. The rise in oil prices means that for end users of construction machinery, it means that the same amount of work will cost more money, so that the end users of construction machinery that have already been profit-making or unprofitable will suffer even more due to the fierce competition in rental prices due to excessive equipment holdings. With greater pressure for survival. Fuel economy is the common dream of all end users. As the leading company of China's power, Weichai Power , knows that fuel-efficient can not only reduce the cost of use for end users, but also has important significance for reducing the increasingly serious air pollution. It is highly forward-looking to focus on fuel conservation as the focus of research and development. In 2010, the company launched the â€œOptimization and Matching of Construction Machinery Power System Assemblyâ€ R&D project, which lasted more than 14 months and conducted the performance and fuel consumption comparison test of the ZL50 wheel loader, the engine performance optimization test, and the torque converter performance. A total of 11 tests, including optimization tests, achieved low engine speed matching, shifted the engine's working area from a high fuel consumption area to a low fuel consumption area, realized a power system fuel economy, and held the Weichai Power Business Conference held in January 2012. At the beginning, the prelude to Weichai's "Economy Drives in China" campaign was opened. According to reports, in 2013, Weichai Power's only engineering machinery segment will hold 300 fuel-efficient experience events. Recently, the author had the privilege of participating in Weichai Power's National Fuel-Saving Experience Camp of China 's Fuel-efficient Power- Weichai Power-Longgong D Series Loader held in Nanyang, Henan Province. Nanyang is Zhuge Liang's land for cultivating land. The famous â€œthree visits to Maojianâ€ story took place here. Nanyang is also one of the few cities in China with a population of 10 million. It has abundant mineral resources and is one of the important markets for loaders. 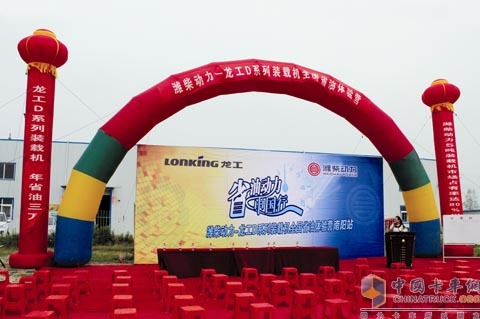 The Weichai fuel-efficient experience camp was jointly organized by Weichai Power, China Longgong, and Henan Tengniu Construction Machinery Co., Ltd. (Longgong agent), and the experience was still end users. In order to make the experience activities objective, fair, and convincing, the experience equipment used in this event was 3 mainstream loaders with a rated load of 5 tons. One is the Longgong LG855D loader equipped with the Weichai Blue Engine II. The other two 50-loaders of different brands are equipped with two different brand powers. The experience activity tests the fuel consumption within 30 minutes for the three equipment under the same operating conditions. The author noticed a detail that the two factories of other brand loaders were covered, the test did not damage the competitor's reputation, and they used facts to show that whether it was Weichai or Longgong, they were full of confidence in their products. Fairness is also reflected in the rules of experience: Because of the driver's skill level and work environment, the job site and the driver are reversed every 10 minutes. If the operating points are divided into A, B, and C, and the equipment is divided into No. 1 car, No. 2 car, and No. 3 car, then the No. 1 car of No. 1 corresponds to No. 1 driver at the beginning of the operation, and No. 2 of No. 2 car corresponds to No. 2 Driver, C3 car corresponds to driver No.3; after 10 minutes: car No.1 moves to point B, the driver is No. 2; car No.2 moves to point C, the driver is No. 3; 3 good car moves To Jiadian, the driver is No. 1; after 20 minutes: No. 1 vehicle moves to C, the driver is No. 3; No. 2 car moves to A, the driver is No. 1; No. 3 car moves to C, The driver is No. 2. Not only that, three users at the site randomly selected to monitor and verify the fuel consumption of each device. Although it is already in midsummer and the sun is at its height, usersâ€™ enthusiasm for experiencing activities is similar to the hot weather. They come to the experience venue early and want to see for themselves whether the Lonker D Series loaders equipped with Weichai Blue Engine II are powered. Really as fuel-efficient as legend. After the three supervisors jointly proved that the metering oil gauges of the three equipments were all displayed as zero, the commander of the experience activity commanded three equipments to roar in unison to begin operations. After 10 minutes, the equipment exchanges hands and positions and continues operations. After 20 minutes, another call was made between the machine operator and the aircraft. Thirty minutes later, the chief commander called a â€œstopâ€ and the equipment that had just been used for wild operations stopped immediately. 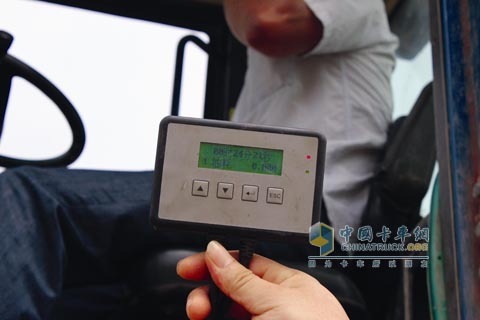 Under the supervision of the three supervisors jointly measuring the meter data of the three devices, the inspectors recorded the final data. The result of the experience is that the Longgong LG855D loader has a fuel consumption of 4.218L; the fuel consumption of the other two devices is 6.492L and 5.379L, respectively. "Can save so much oil!" The on-site user sent a heartfelt sigh. The reason why Longgong LG855D loader is so fuel-efficient is that Weichai is optimized to match the powertrain of Longgong LG855D, and the engine speed is only 1900rpm, making the power system more fuel-efficient. At the same time, the application of the electromagnetic constant-temperature fan enables the fan speed to be automatically adjusted according to the change in the water temperature in the engine return pipe, which greatly reduces the wasted power of the engine fan, thereby reducing engine fuel consumption. We know that Weichai Power has occupied more than 80% of the 5T loader market for 8 years in a row. The reason why Weichai Power is favored by users is that fuel economy is the hard truth. It has developed a "93 sand" for the harsh working environment of construction machinery. "Dust filter" is also one of the reasons. The "93 dust filter" passes the double-stage strainer (cyclone filter + integrated swirl tube pre-filter) to ensure the coarse filter effect and reduce the burden on the filter element; the double-stage filter element (main filter element + safety filter element) can be used in the main filter element. When disassembling, it prevents dust from entering the engine and requires no maintenance; the filter element is sealed in the form of a radial seal to improve the reliability of the seal. The "93 sand filter" prefilter has obvious effects, which can extend the filter replacement time by more than 50% and reduce maintenance costs. The "93 sand filter" can effectively prevent the engine from wearing out early, burn oil, etc., and prolong the use of the engine. Life, reduce the user's cost of use. The good after-sales service and perfect after-market service of Weichai is also the reason for its good reputation. When the user's equipment fails, Weichai promises that the general failure will be resolved within 24 hours after the repair, and a return visit to the user can be said to solve the user's worries, and Weichai's remanufacturing service has solved the user's ultimate concern . It is no wonder that Mr. Lin, the Forklift Truck Business Manager of Longgong Henan District, met Zheng Wenjian, the construction machinery business manager of Weichai Henan, and he strongly urged Longfor's forklifts to also be equipped with Weichai Power. On the scene, Wu Boss of a Kaisha Quarry stated to the author that although he had not used a loader equipped with Weichai power before, the Shanxi Heavy Truck he bought was Weichai Power, which traveled more than 110,000 km in less than six months. Not only does it save fuel, but apart from normal maintenance, there is almost no fault, making him very satisfied with Weichai power. He purchased a loader this time. Saving fuel on equipment saves money; equipment failure rates are low and attendance rates are high, not only saving money, but also making more money. These are real truths. For simple end-users, nothing is more important than this. Weichai Power has achieved a good reputation among users due to its low fuel consumption and low failure rate.